The Fayetteville Young Feminist Salon will feature the “When the Bough Breaks” documentary on April 21, 2018. 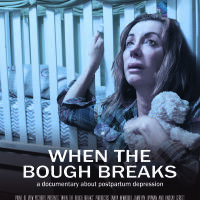 “When the Bough Breaks” is a feature length documentary about postpartum depression (PPD) and perinatal mood disorders (PMD). After the screening, we will discuss it. Do share with your family and friends. We hope to see you there! NOTE: This documentary is different from the 1994 or 2016 motion pictures bearing the same name.